ADF Task Flow support is improved in ADF 11g R2, now we have option to define multi task flow binding with dynamic number of regions - 21.10 Configuring a Page To Render an Unknown Number of Regions. This means we can implement our own UI Shell with dynamic tabs. For UI demo, watch recorded video - it shows UI for sample application (MultiTaskFlowApp.zip). Each tab brings region from multi task flow binding, region can be removed/added together with tab as well as selected to be current. 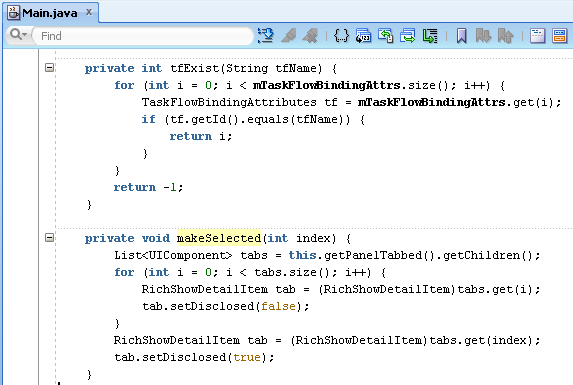 Multi task flow binding representation with tabs, is only one of the possible variants, you can implement other UI models as well. Ah and yes, in 11g R2 - tab close icon looks much better - it comes together with tab, just like for Web browsers. Could you please help in one of ADF accordion implementation. for each student in that school there would be an accordion component say student1, student2, student3 etc.. number of students-accordion will be dynamic based on number of students in that school. When student1 accordion is clicked, it should show all the subjects that student has enrolled. Similarly if student2- accordion is clicked it should corresponding list of subjects for that student. Any inputs or pointers on dynamic accordion. One approach would be iterate on number of students and create accordion accordingly..not sure it will work.. Please send your response on my email: varunkgupta1@gmail.com. how can we open new tab from another tab(region), not from created menu? Can not access pageFlowscope method(regionLaunch)to open new tab. Following your sample, let's try open departments in new tab from locations. You can create your bean with custom method, and generate Data Control on top of that bean. It will be accessible across all Task Flows (if not opened in Isolated scope). Maybe I didn't explain it well. I don't need to open it in new browser tab, but in a new application tab(call another region). In your sample task-flows are being called by click on menu links, but if you try to call it from already opened region it fails. No, I understood you correctly. What I was saying - is just example, you can use approach from provided blog sample to call Main method, which would open new application tab. You can apply same approach for your use case. The trick is - Data Control is shared across all Task Flows, and you can call methods without calling Session Scope. Thanx. I get the idea, but I can get it work :). I got NPE when try to call DataControl method which fires new tab/region. Double check if your task flows are set to share data control (by default). May be its changed to Isolated? Data control share is ok. But stil same error. Not sure, but I believe that problem remains in pageFlowScope of mangaed bean, because taskflow list and varaibles are in that bean. Yes, perhaps something is missing. Generally it should be possible. May be you should move out logic from your bean into Data Control class. Andrejus, in your projects which do you preffer fragments or pages? I'm stucked with a project and cannot decide which to use or which suites best to our requirements. Do you have any particular reason where and when to use fragments or/and pages? Pages are good when system is smaller and menu model is not complicated (for example you open pages from central index page). Fragments are very good, when there are many ADF libraries and you need to integrate all together. Also its much easier to build menu model with Fragments, control pending changes during navigation, etc. sorry for late response, but I was away for few days. Thanx very much for sharing your opinion about pages and fragments. This is excatly what I needed to confirm my ideas about our project. So we decide to split it in several pages as main categories/processes and fragments in those pages as subcategories/subprocesses. If I use this in the parent component, it sets all tabs' text to italic. Another issue I'm getting is when attempting to close the last remaining tab - the handleCloseTabItem method isn't invoked, whereas it works for other tabs. Thanks for sharing UI demo sample application.“Custom Browser Helper” Provides more advanced functionality in any Browsers. How do I hide all tabs for the first time applications launched? In your example, all tabs are shown in first loading of application. This is easy. 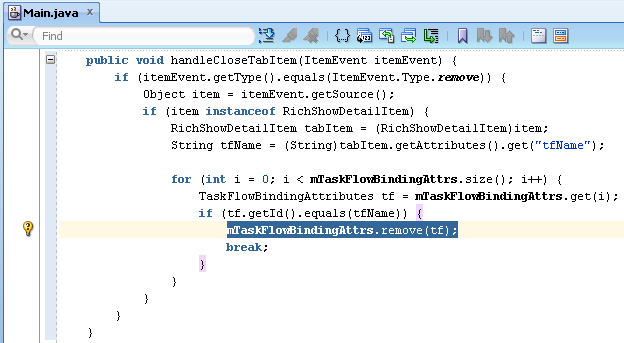 Just modify Main bean - in constructor remove task flows added into mTaskFlowBindingAttrs. "tfAttr.setId(Locations)", and I understand that this is the label of panelTabbed. When I try to set a label with space it does not work. Do you know a way to achieve this? I want to set a label for the tab with spaces. ADF API for this method unfortunately doesnt accept text with spaces. In my another project, I have additional method which I call from ADF UI get label by ID (labels are maintained in separate collection). Further to the post from Higor Fortunato regarding spaces in Tab labels, could you point me to an example of the approach you take in "my another project" that you refer to in your response to Higor? Also is there a way to make new Tabs appear as the last rather than the first tab? I have adapted your Custom UI Shell in an application I am developing and think it a terrific approach to the problem. Yes, I was able to implement last tab to be selected by default. Actually we have developed our own template, where we handle tab labels, also last tab to be selected by default. 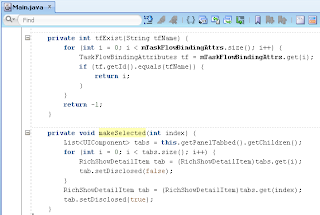 Is not so easy to explain, it would require code posting, because its all in Java. May be in the future we will post it on the blog, for now we use it only in our projects as alternative for UI Shell template. For example, for the last tab - we always keep dummy invisible tab at the end and replace it with newly added tab and mark it selected. Dummy tab is shift to the right, this allows to mark last tab selected. Yes, this should work. You need to tabs behavior. Could you send your sample app to me by email, I will take a look - whats wrong. I am very new in Oracle ADF.Can we create dynamic tab without dynamic tab shell using? Hi Andrejus, is there a way to do this in ADF 11g (prior R2).